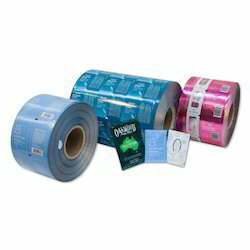 Manufacturer of a wide range of products which include printed rolls. Our organization has successfully expanded its business in market owing to the offered elevated quality array of Printed Rolls that are available in variety of designs, sizes and colors. Used in different industries for packing related applications, these rolls are designed by our skilled professionals in compliance with latest market trends using high grade basic materials. Acknowledged for their excellent craftsmanship and tear resistance, the offered rolls are highly demanded in the market.